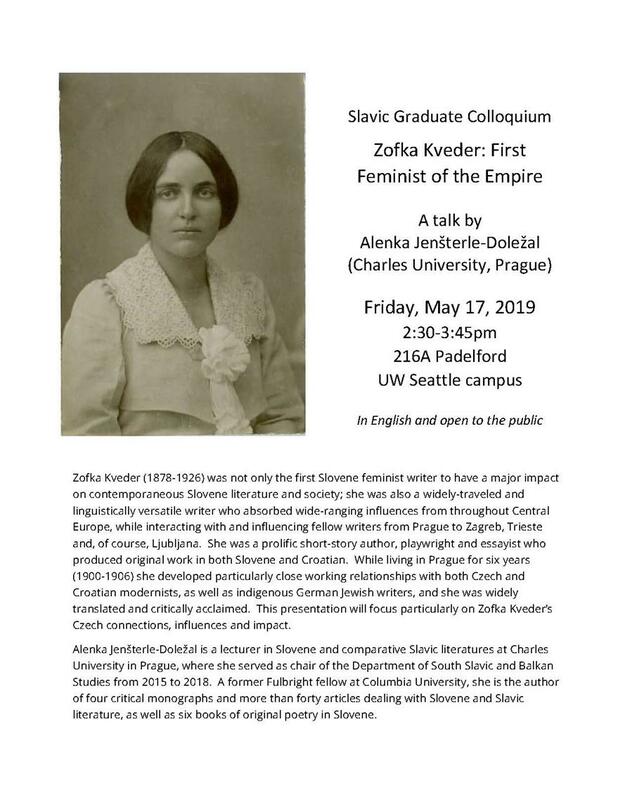 Friday, May 17, 2019, 2:30 – 3:45 p.m.
Zofka Kveder (1878-1926) was not only the first Slovene feminist writer to have a major impact on contemporaneous Slovene literature and society; she was also a widely-traveled and linguistically versatile writer who absorbed wide-ranging influences from throughout Central Europe, while interacting with and influencing fellow writers from Prague to Zagreb, Trieste and, of course, Ljubljana. She was a prolific short-story author, playwright and essayist who produced original work in both Slovene and Croatian. While living in Prague for six years (1900-1906) she developed particularly close working relationships with both Czech and Croatian modernists, as well as indigenous German Jewish writers, and she was widely translated and critically acclaimed. This presentation will focus particularly on Zofka Kveder’s Czech connections, influences and impact. Alenka Jenšterle-Doležal is a lecturer in Slovene and comparative Slavic literatures at Charles University in Prague, where she served as chair of the Department of South Slavic and Balkan Studies from 2015 to 2018. A former Fulbright fellow at Columbia University, she is the author of four critical monographs and more than forty articles dealing with Slovene and Slavic literature, as well as six books of original poetry in Slovene.